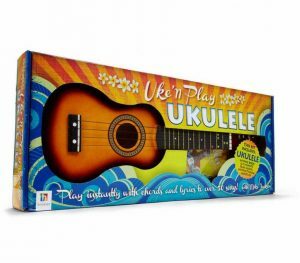 Hinkler Uke’n Play Ukulele Kit – complete with ukulele, instruction/song book and play-along CD. Absolute beginner level. 3 simple chords to learn and you’ll be playing over 50 well-known songs. Available worldwide at BigW, Costco and Barnes&Noble.